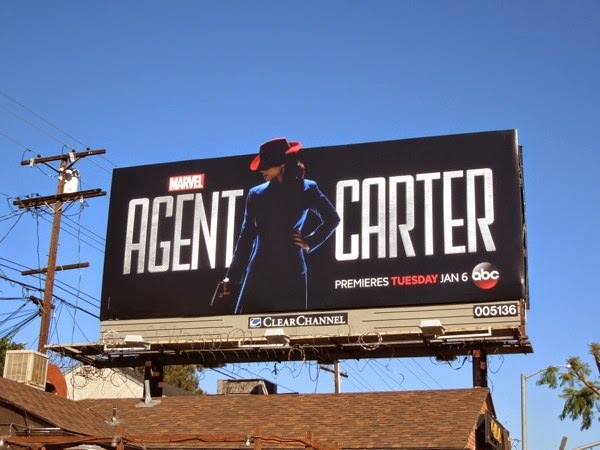 In January 2015 Hayley Atwell reprises her role as 'Peggy Carter', or 'Agent Carter', as after losing her love, Captain America, she tries to find her place in post-World War II America as she finds herself marginalized as the men return from war. It looks like this heroine will have her hands full working at the covert Strategic Scientific Reserve (later absorbed by super spy agency S.H.I.E.L.D.) and carrying out secret missions for 'Howard Stark' ('Iron Man's' dad), with the help of his butler 'Edwin Jarvis'. She's already had her own Marvel One-Shot on the Iron Man 3 DVD and Blu-ray release, plus guest roles in Captain America: The Winter Soldier and Marvel's Agents of S.H.I.E.L.D. second season, so it's high time she got her own series. 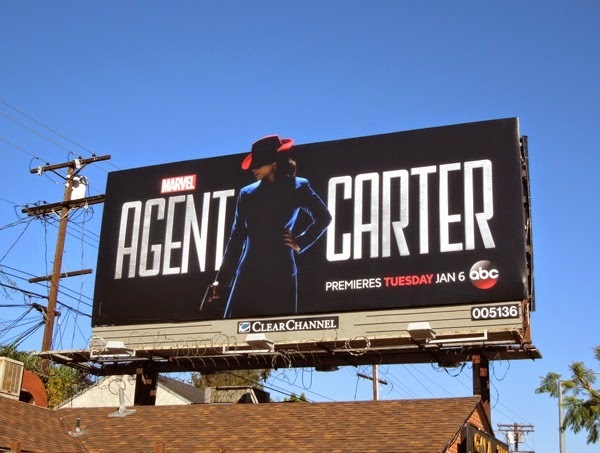 The sophisticated silhouette ad creative for the series premiere is perfect for the shadowy world of super-spies and espionage after WWII, and has a confident and playful, crime noir feel to it. 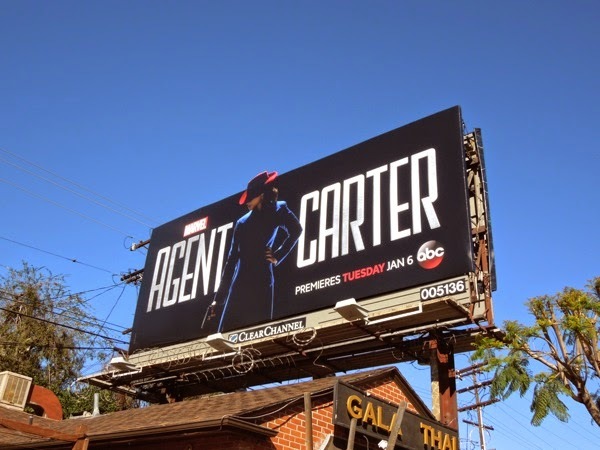 This special extension billboard for Agent Carter was snapped along Barham Boulevard at Lake Hollywood Drive on December 22, 2014. 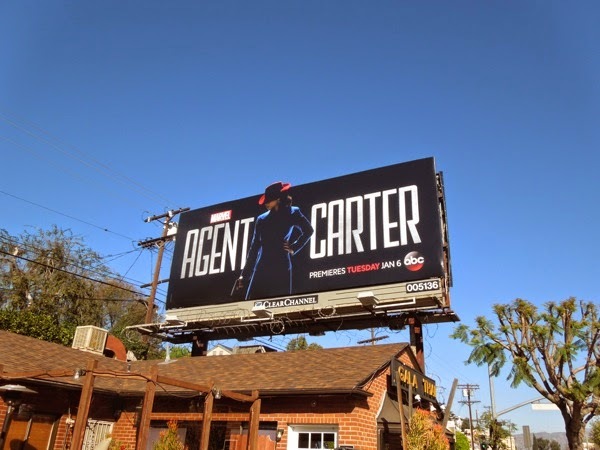 If you like this Marvel series billboard, be sure to also check out these Agents of S.H.I.E.L.D. 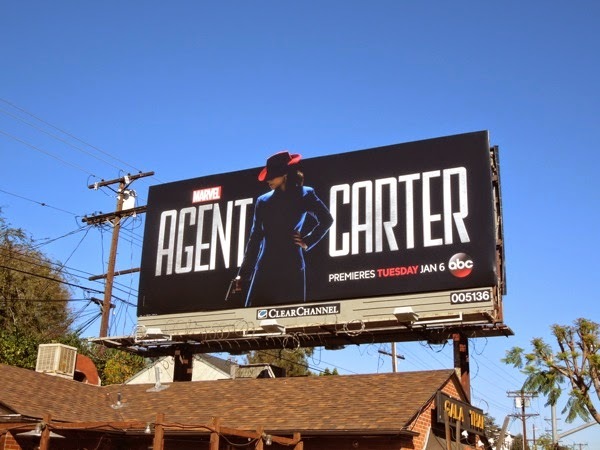 TV series billboards and these Captain America: The First Avenger movie billboards in which Peggy Carter was first introduced on the big screen. Sometimes the best man for the job is a woman, and with its mix of Marvel cinematic and televisual universe connections, distinctive period setting and wonderful actress, Marvel's Agent Carter will be the one to watch in the New Year, kicking off with a two-hour debut for an exciting eight episode season that sits incredibly well between Agents of S.H.I.E.L.D. 's mid-season break. The world of 1940's spies has never looked so good. UPDATED: Fans of the show can also enjoy these Agent Carter season two costumes on display.